Over the past decade, CAMH’s Dr. Jeffrey Meyer has studied brain imaging with the goal of discovering the causes of depression. His research led to the development of a natural and effective dietary supplement that reduces baby blues, a precursor to post-partum depression. This is significant; 13% of new moms experience post-partum depression, often with considerable and lasting impacts on their lives and relationships. The nutritional kit consists of three supplements. They were carefully selected to compensate for a surge in the brain protein MAO-A, which occurs in the early postpartum phase, and which also resembles a brain change that persists for longer periods in clinical depression. Both findings were discovered in previous brain imaging studies by Dr. Meyer’s group. Click here to prevent more women and their families from experiencing mental illness, like post-partum depression. The results support further research to replicate the effects in a larger sample in a randomized, controlled trial, and further assess the kit’s ability to reduce both the postpartum blues as well as clinically diagnosed postpartum depression. Donate now to speed up treatment for moms and their families. The journey from donations to discovery. Thanks to the support of donors like you, Dr. Meyer and a team of researchers translated research that began over a decade ago into an important discovery. The discovery made headlines around the world. 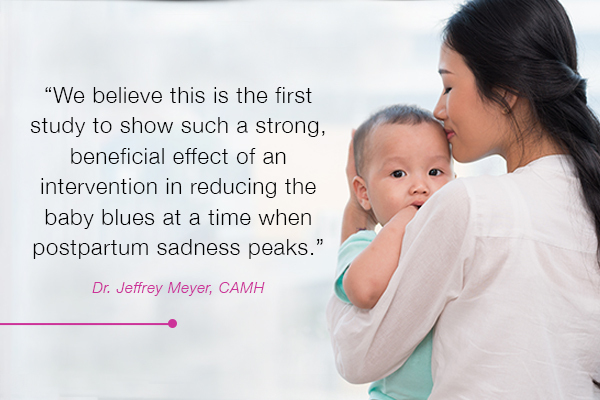 By uncovering the effect of this enzyme in early post-partum, one of the highest risk points for depression, Dr. Meyer developed a natural treatment that reduces new moms’ risk for the baby blues and, ultimately, post-partum depression. Help put this breakthrough to work sooner for those who need it most and prevent more women and their families from experiencing mental illness, like post-partum depression. Thank you. Your commitment to fighting mental illness is inspiring.